It is now illegal for any person to have river herring in their possession – this includes blueback herring and alewife. All river herring inadvertently caught by anglers must be immediately released back into the water. In Virginia, regulations regarding the harvest and possession of river herring are set by the Virginia Marine Resources Commission. On January 1st, 2012, VMRC enacted a regulation which makes it unlawful for any person to be in possession of river herring in the Commonwealth of Virginia. Anglers with concerns or questions should contact the Virginia Marine Fisheries Commission (VMRC) in Newport News at 1-800-541-4646. Additional information can be found on the VMRC website (http://www.mrc.state.va.us/regulations/fr1260.shtm). The Rappahannock and Rapidan Rivers provide excellent smallmouth bass and redbreast sunfish angling above Fredericksburg and tidal influence. Additionally, herring, shad and striped bass run the river each spring and ascend past Fredericksburg now that Embrey Dam has been completely removed. Below the fall line, the Rappahannock has good populations of white perch, largemouth bass, striped bass, black crappie, yellow perch, channel catfish, and blue catfish. Several of these species (e.g., yellow perch and channel catfish) are now being found above the old dam site. The fish community above Fredericksburg is currently in a state of flux and will probably not stabilize for several more years as species of resident and migratory fish establish new territories. The Rappahannock River flows from its origin at Chester Gap in Rappahannock County approximately 184 miles to the Chesapeake Bay. The first 62 miles, from the headwaters to Mayfield Bridge (Fredericksburg), are designated State Scenic River. The river has a watershed of approximately 2,715 mi2, and average annual discharge near Fredericksburg is typically about 1,639 CFS. During Colonial days, the Rappahannock River was a major shipping artery for transporting tobacco, salted fish, iron ore, and grains. The watershed supports a variety of land uses; largely agricultural in the upper watershed, with manufacturing, light industrial, and retail applications throughout. Soil erosion is a problem in the upper watershed. Runoff from the major tributaries (Rapidan and Hazel Rivers) leaves the Rappahannock muddy after even minor storm events. Access to the Rappahannock system (defined here as the Rapidan and Rappahannock Rivers) is fairly limited and primitive. Established access points on the Rappahannock (traveling downstream) are at Kelly’s Ford (Route 672 off Route 651) in Culpeper County and Motts Landing (Route 618) in Spotsylvania County. About 25 miles separates these canoe/Jon boat slides, and an overnight camp stop is nearly mandatory for those that float fish this reach. Another access point is located on the Rapidan River at Elys Ford (Route 610) in Spotsylvania County about 14 miles upstream of Motts Landing. Access may also be gained via several non established points. These consist of VDOT right-of-ways along bridges (e.g., Route 522 on the Rapidan). Many anglers choose one of the canoe liveries that have agreements with landowners and provide floats of varying length from access points not available to the general public. For more information, contact Clore Brothers (540-786-7749), Rappahannock Outdoor Education Center (540-371-5085) or Rappahannock River Campground (800-784-7235) . The Rappahannock River’s character changes abruptly in Fredericksburg at the fall line (the limit of tidal influence). Above the fall line, the river is usually clear, swift, and dominant substrates are bedrock, boulder and cobble providing perfect habitat for smallmouth bass and related species. However, below Route 1 the river is tidal, and the substrate is finer, dominated by sand; and the water is frequently murky. Species composition shifts with habitat, and largemouth bass, catfish and anadromous species are more common in and below Fredericksburg. Boaters and anglers can now navigate from upstream access points such as Motts Landing across the old Embrey Dam site and into the tidal waters adjacent to Fredericksburg. Blue catfish were stocked below Fredericksburg in 1974, 1975, and 1977; channel catfish in 1975 and 1987. Tiger musky were stocked above the fall line in 1980, 1981, 1982, 1983, and 1985 but were discontinued due to poor survival. Other species such as smallmouth bass were stocked well over 100 years ago but now are naturally self sustaining populations. Boating activity above the fall line in Fredericksburg is limited to smaller vessels such as canoes, kayaks, and hand-carried johnboats. 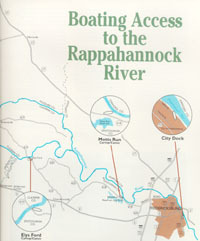 Access to the Rappahannock River is detailed below. The Rappahannock River is considered a public waterway from the U.S. 211 Bridge to the Chesapeake Bay, yet there is no formal access point above the Kellys Ford launching ramp downstream from the U.S. 29 Bridge. Several secondary roads cross the river between the U.S. 211 and 29 bridges, but using these sites to gain access to the river is subject to the approval of private landowners. Most river goers, entering or exiting the Rappahannock at the Old U.S. 29 Bridge, park at Ande’s Store on the Remington side of the river. Again, make sure to get permission from the property owner. This 4.5-mile stretch of river includes the famous Kellys Ford Rapids, which are popular amongst beginner and experienced canoeists alike. Individuals often run the river several times in a single day. The rapids, depending on the river’s current height, range from Class II to III. The Kellys Ford launch and parking areas are on the south, or right, side of the river going downstream. There is good bass fishing both above and below the rapids. This is the most popular float trip on the Rappahannock, but also the longest—two full days (25 miles). Access is off of the Secondary Route 620 on the south side of the river. Going downstream, both access points are on the right. Parking is available at both access points. Near the confluence of the Rapidan River, which flows in from the south (or on the right side of the Rappahannock going downstream), there are some Class II rapids. Approximately six miles of the C. F. Phelps Wildlife Management Area border the north side of the river just below Kellys Ford, and the city of Fredericksburg owns 4,800 acres at various points along the river. Check with David King at (540) 372-1023 to view city maps. Many parcels of city owned river land are available for camping. 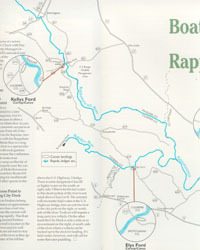 The Rapidan River is mentioned here as it offers a much shorter trip to Motts Run Access Point. Anglers or canoeists can put in at Elys Ford Access Point off of Secondary Route 610 on the Rapidan, travel to its confluence with the Rappahannock, and float to Motts Run in a long day. The Rapidan is a spectacular and remote river that features rock gardens and Class II ledges. Those who want to make it into an overnight trip can camp on the city of Fredericksburg property near the confluence. Take out at Motts Run Access Point just off of Secondary Route 618. There is good fishing for smallmouth bass, sunfish, and a number of other species in the Rapidan River. The Motts Run to Fredericksburg City Dock float is a half-day trip or less (approximately three miles). This trip calls for portaging around Embry Dam, below which currents can move a canoe along quickly. The portage trail is located on the north (or left) side of the river, and it is well marked. Canoeists are advised to stay on the north side of the river as they approach the fast water of the fall line above the U.S. Highway 1 Bridge. There is some dangerous Class III or higher water on the south (or right) side. Otherwise, the fast water in this short section of the Rappahannock is not rated above Class I or II. The canoeist will encounter tidal water at the U.S. Highway 1 Bridge, but can exit the river at the city park on the right side of the river. To do so will require a long carry to a vehicle however. On the other hand, the City Dock is only a mile or so downstream on the right side of the river, where a vehicle can be backed up to the dock for loading. Some flat water paddling is required in the tidal water. Above Fredericksburg, the Rappahannock and Rapidan Rivers provide excellent smallmouth bass and redbreast sunfish angling. River herring (blueback and alewife) and shad (hickory and American) ascend the river through Fredericksburg each spring past the old Embrey Dam site. Recently, the hickory shad run has been very good, although it was off a bit in 2006. Target these acrobatic fighters the two weeks on either side of Easter, but if conditions are right; they can be found much earlier than most people think. Since Embrey was demolished, striped bass, especially juveniles, have been found as far upstream as Kelly’s Ford and Ely’s Landing. The Rappahannock is a river rich in Virginia history, a river that is favored by canoeists and a river that is renowned primarily for its smallmouth bass fishing. Beyond the put-in at Kelly’s Ford landing, canoeists can find 25 miles of stream awaiting them that have changed little over time. The friendly currents push past miles of rich stands of hardwoods spared because of the steep cliffs they inhabit, rock bluffs that have withstood centuries of raging floodwaters, wooded islands begging to be explored and giant midstream boulders that seem to shout “smallmouth bass”. There will be rapids to run, but they are not difficult and long quiet pools where anglers may have to paddle to travel through. The substrate over which clear water flows (providing it has not rained recently) is sandy in places, but in others filled with ledges and rock gardens where bass lurk. When anglers leave the Kelly’s Ford launching ramp, they are committed to a minimum of two days on the river. On the left as they leave the launch area is approximately five miles of the C.F. Phelps Wildlife Management Area. The next public access; however, is Motts Landing, about 25 miles downstream. Look forward to a leisurely trip – fishing, admiring the river and its environs, and taking turns at fishing and paddling. In addition to smallmouth bass and redbreast sunfish, anglers floating the river may encounter native fish such as catfish, chain pickerel, fallfish, and suckers. There is also limited fishing for bluegills, crappie, and largemouth bass. Periodically, canoeists and anglers will pass the mouths of numerous tributaries such as the Hazel and Rapidan rivers – good smallmouth streams in their own right. Most upriver canoeists and anglers end their trip at Mott’s Landing on the right near the city of Fredericksburg, but a hardy few may want to tackle the fall line rapids that end at the U.S. Highway 1 bridge where the high gradient upstream river water collides with sluggish tidal flats. The take-out point is at the City Dock Landing on the right – or south side of the river another mile downstream. Once you have floated and fished the Rappahannock, you will always want to return. It’s just a matter of time before you accept this challenge again. For more Fishing Information by float section, see Maps and Directions. The following businesses/organizations provide rental and educational services pertaining to the Rappahannock River.